CONCERTS * SHOPPING * MUSEUMS * PLAYS * EVENTS * MORE! 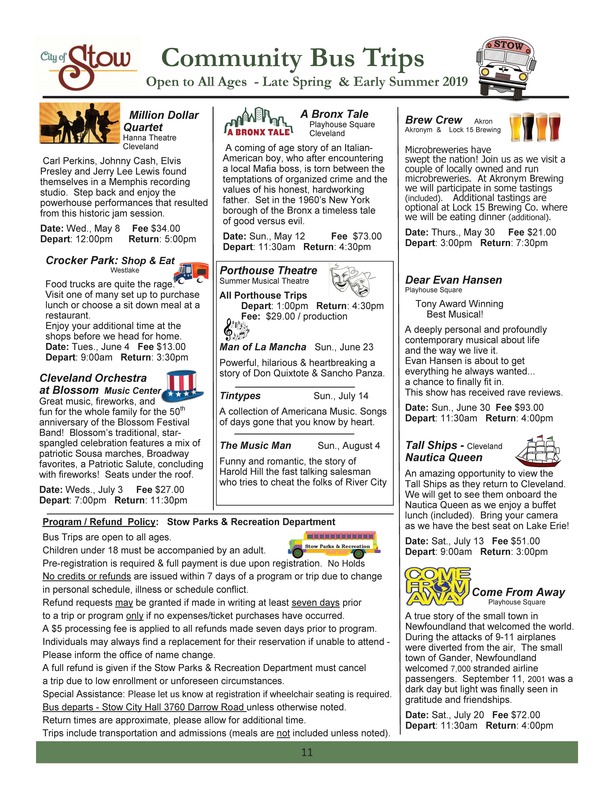 A variety of bus trips are planned each month and are open to all! For the latest schedule of trips, click the button. Bus trip are open to all ages. Children under the age of 18 must be accompanied by and adult. Pre-registration is required and full payment is due upon registration. No Holds. Be sure to check our policy before signing up for a trip! Trip Cancellations / Refund Requests: No refunds will be issued within seven days of the scheduled trip. Refund requests prior to seven days are handled on a case-by-case basis. A refund is dependent on ticket purchases, minimum registrations or other expenditures. A family emergency, illness or change of plans does not constitute an automatic refund. In the event a refund is granted, $5 processing fee per person is applied. Substitutes: Individuals unable to attend may find a replacement, all transactions occur between the two parties. Please notify the Parks & Recreation office of any change. No Shows: Refunds will not be issued for “No Shows” on day of trip. Parks & Recreation Cancellation: A full refund or credit is given if a trip is cancelled by the Stow Parks & Recreation Department due to insufficient enrollment or other unforeseen circumstances. Wait Lists: Registration is on a first-come, first served basis. When a trip is full, a waiting list will be initiated. If space becomes available we will notify individuals on the wait list in order of their registration. A person is registered only when payment is complete. Weather: In most cases trips will go on as planned unless the department has cancelled the trip. Registration for Friends: If you are registering someone else for a trip, in addition to payment, you will need the following information: Name, address, and contact phone numbers. Trip Departure: Trips depart from Stow City Hall unless otherwise noted. Please park to the back of the lot, so the public will have easy access to City Hall. All trips leave promptly as scheduled, please be on time. Failure to board the bus at the scheduled time is not cause for a refund. Please be aware of all time appointments. Return times are approximate; please be flexible in your arrangements. Trip Changes: Trips are scheduled in advance; on occasion tour dates, times and itineraries may need to change. Please take note of any updated information during registration.